Dingle has become well known for its food, and is now officially "Ireland's Foodie Town". The blue waters surrounding the lush green hills of the Dingle Peninsula give rise to not only the beautiful scenery that it is now famous for but also to an intense devotion by its residents to the fresh, locally landed, reared and produced foods. The small town offer visitors 52 places to eat enabling you to feast on not only the impeccably fresh fish landed daily but also on an array of locally produced food and drink which draws its inspiration from our naturally bountiful surroundings. The people of the Dingle Peninsula have adopted a type of self sufficiency and we are now producing as large a range of products locally as you would find anywhere in the world, from locally landed fresh and smoked fish, lamb, beef to cheeses and ice cream made using the milk of the rare Kerry Cow and local free range eggs, locally produced Pudding, sausages and rashers, preserves, breads, chocolates, pies, salamis, chorizo and patés. Visitors to the area are welcome to sample the local delicacies in every shop, eatery and bar in Dingle, tour the local brewery and distillery, visit the weekly farmers' market and follow the Dingle Peninsula Food Trail. The food trail brings visitors on a veritable treasure hunt of Dingle's Foodie offerings. Other visitor activities include foraging walks, boat charters allowing you to catch and cook your own fish, cheesemaking classes and cookery demonstrations. The peninsula offers a range of dining from the formal to the informal, featuring the best of ingredients, many of them locally sourced. 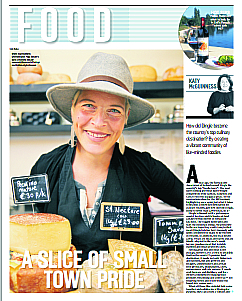 Read this article, from the Sunday Times of 6 September, A Slice of Small Town Pride by Katy McGuinness.